The Centers Kjersti Grønning has been awarded a PhD-stipendiat position from The Norwegian Nursing Association (Norsk Sykepleierforbund) to run the project «Insights into improving evidence-based-practice in health care services: involving undergraduate nursing students in clinical research settings (INSIGHT)». The project is based on a previous research application by Kjersti, Beate André and Geir Arild Espnes. On May 31. 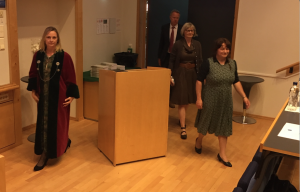 Center member Ruca Elisa Katrin Maass defended her thesis «The neighborhood as a salutogenic setting: How can Salutogenesis contribute to the development of strategies for promoting health and strengthening SOC through a focus on neighborhood resources» at the Faculty of Medicine and Health Science. The Center have for some years been involved as a mentor for building a HP-Research Centre at National University of Singapore. the implementation of HP-activities at Wellness-Centres for the elderly around in Singapore. 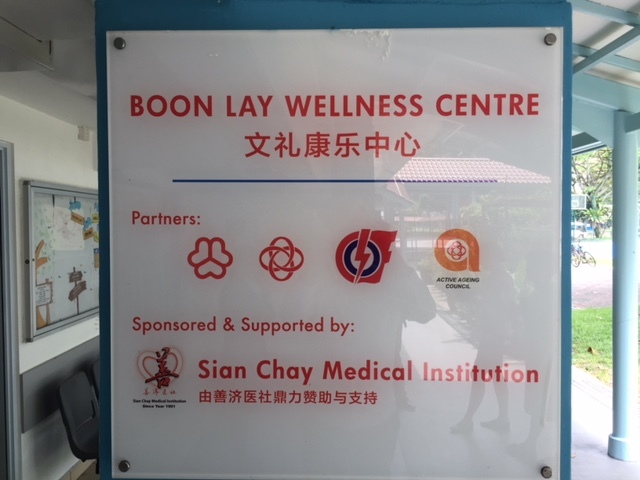 The project is called Salutogenic Healthy Ageing Programme Embracement (SHAPE), funded by the Singapore Health Ministry, and is well into its piloting phase. The study is described in the enclosed article. In September a group of researchers from NUS will visit Trondheim in hope of further expanding the collaboration. On Friday June 1st, Dr HC at NTNU and Emeritus Professor Don Byrne at Australian National University (ANU) was greatfully thanked for its long lasting membership of NTNU Center for Health Promotion Research’s advisory board. 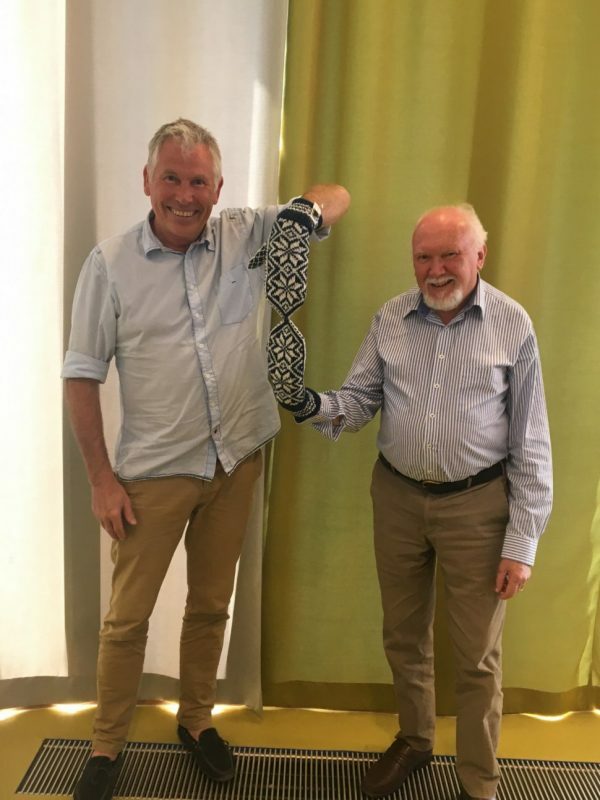 The Selbu-mittens in the picture are still connected, symbolizing the close relationship between ANU and the NTNU Center for Health Promotion Research. Professor Byrne have visited Norway 22 times and will be returning during February 2019 to see the Northern lights – therefor the Selbu-mittens. Thank you Don for your long lasting commitment to the NTNU Center for Health Promotion Research. You will be missed. On May 25th the Center had a visit both from the Norwegian Parliament and the County Board. The visitors from Parliament; MP Heidi Greni, MP Kjersti Toppe and the Vice Major of the County Board Tomas Iver Hallem was oriented about the research in the Center. Both its Regional, National and International research and the Networks the Center works in. 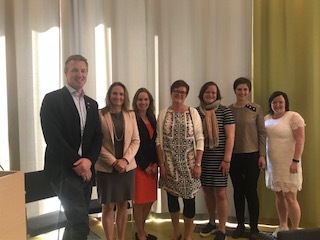 We will be having politicians visiting the Center more often in the time to come in order to inform them on the Regional, Norwegian and International Health Promotion Research.